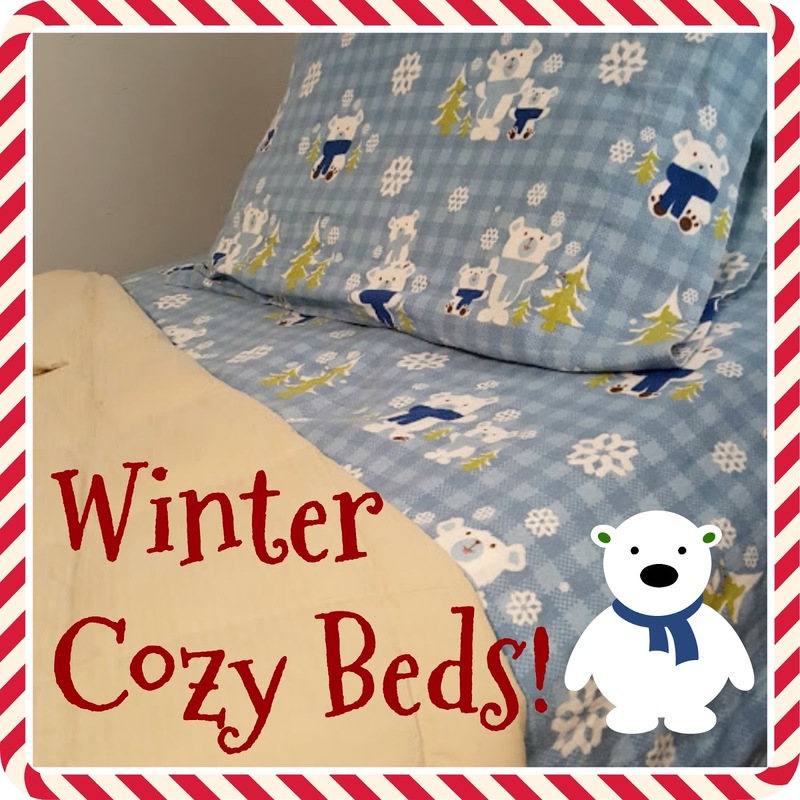 How to Make Your Child’s Bed Cozy – All 3 of my kids love their beds, and in the winter they’re extra cozy with warm flannel sheets and cozy blankets that make their beds extra special! Believe me, when it’s freezing outside, the last thing you want is your child to sleep in a cold bed or not have enough blankets to stay warm. They get a terrible night’s sleep,they’re cold, they’re grumpy and that’s the last thing you want for your kids! I want my kids to wake up in the morning refreshed, cozy and warm. I put a lot of emphasis on my kid’s beds and the quality of sleep they get. Your kids can have a lot or a little, but when you feel safe and cozy in your bed at night, I think it can make all the difference in how they feel! Bryce loves his bed, his pillows and his stuffed animal “Patches”! I know he doesn’t like a lot of fluff or a ton of blankets, so that’s when it’s really important to have good quality sheets and blankets so you don’t need a lot of layers. His sheets are from JCPenny’s, his main quilt is from Sam’s Club and his thick-weighted blanket is from Target! His flannel sheets are Gnomes & Critters Skiing, I think this is the perfect pattern for an “older” boy’s bed! Soft lighting at night is key to making your room feel warm & cozy and these battery operated Christmas Lanterns are perfect from Walmart. See, his bedding isn’t thick or suffocating, the material is just good quality so you don’t need a lot to feel warm and cozy! But with a little determination, their beds are warm and cozy too, and with the perfect sherpa throw blankets. Their bunk beds are from Amazon, their bedding is from Target and their sherpa throws are from Sam’s Club. I typically buy the girls’ bedding from Target, I love their Pillowfort™ line they carry and it’s good quality and washes well. Maddie also doesn’t like tons of blankets, so the quality is important for her to stay warm and cozy! They also have a Christmas lantern for a warm glow type light, they leave this light on at night when they fall asleep. It has a timer feature! Unicorns are all the rage this year and Maddie loves horses, so naturally she wanted the unicorns! Another favorite this year is Llamas and Naomi loves the Llama Llama books! Now if it was left to Naomi, she would have about 10 blankets layered on top of her quilt, lol! The girls room also has a cute little Christmas tree they decorated with dress-up jewelry. It adds another layer of winter coziness with the soft lighting. Warm & Cozy Flannel Sheets. A nice weighted Bed Blanket or Throw. That’s my recipe to making my kids’ rooms fell cozy and warm this winter! Here’s my last year’s version of their Winter Cozy Beds if you’d like to check it out! I would love to know how you transition your bed for winter?! There is nothing nicer than a cozy bed in the winter.